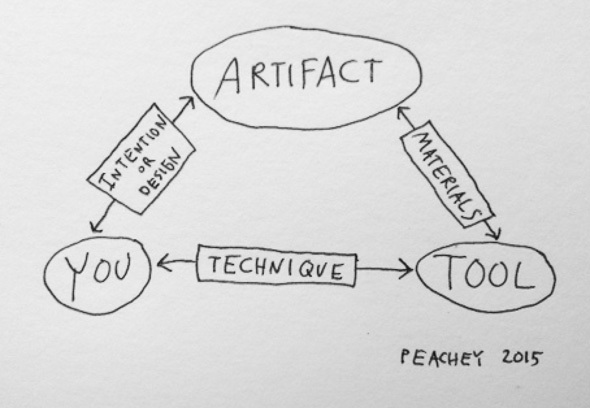 A work-in-progress diagram of the interactions that take place when performing a craft. I’ve been thinking about using tools for a while now, starting in 2004 with a preliminary (and upon rereading inadequate) exploration in Vol. 1, No. 1 of The Bonefolder. Since then, the cultural literacy of tool use continues to decline. In fact, I often encounter people who think they can pick up any tool and it will work fine without any evaluation, prepping, sharpening, maintenance, etc. If nothing else, thinking a bit more about tools before using them can lead to more successful craft outcomes. This work-in-progress diagram summarizes some of my thinking. David Pye’s concepts of “workmanship of certainty” and “workmanship of risk” fit nicely into it; technique forms a continuum between you and the tool, not residing completely in one or the other. In paring leather, for example, using a schar-fix or Brockman paring machine involves relatively little technique from you, but resides mostly in the machine. Of course, you still have to know when to use it, and set it up and maintain it. Failure is often catastrophic, it usually works well or it doesn’t. This is the nature of the machine. A middle ground between you and the tool might be the spokeshave. Although a 151 spokeshave needs to be modified to work well, it is safer and quicker than using a French or Swiss knife to scrape the leather. It requires more skill to use than a paring machine, but accidents are usually small tears, or sometimes chatter, rarely catastrophic, can lead to uncomfortably small small pieces of leather. The most risky way to pare leather overall is with a French or Swiss knife. The locus of technique is almost entirely dependent on your skill. It takes a steady hand and a lot of practice, but I have seen binders become suprisingly adept at it. Similar to the paring machine, failure can be catastrophic, like cutting a hole in the middle of the spine. All three of these methods of paring are not mutually exclusive, often they are all used by the same binder for various purposes at various times. There is also room for conservation work in this diagram. Your intention on the artifact is much more limited due to ethical considerations about preserving existing information inherent in the artifact, there often has to be more creative thought put into material selection and tool use. If you are paring the leather on the original spine of a book that will be rebacked, there is little or no margin of error. A loss becomes a loss of information in the artifact. You can’t buy another one. Your tools have to work perfectly. Materials also place limits on an original design. Often beginners want to experiment with something new, unique or unusual. There is nothing wrong with this, but it is usually much more difficult than performing a craft activity in a more traditional manner. Unusual materials can require unusual tools. One of the joys of craft is when the three elements in this diagram are so integrated that we think through the tool and into the artifact. It becomes embodied, a natural extension of our hands. We often call this muscle memory, or getting a feel for something. Again to use a paring example, when you are competent, the leather pares down quite simply and easily without much conscious thought. When you first learn to pare leather, you need to conscious of how hard, soft, stretchy and thick the leather is, how sharp your knife is, the blade angle of the knife, the bevel angle of the knife, the angle you hold the knife at, where you start the cut, and the amount of leather you are cutting at one time. This is a lot to keep track of. I think many of us forget how much of an interplay there is between these three elements. It is important to remember that when things are not going right in any craft, it is not completely your fault, or the tool, or what you are making: it is usually an inter-relationship that can take some time to sort out. That’s one reason why we take classes to learn things.